Last night when I was taking Trigger and Dooley outside one last time before bed I discovered a dead juvenile opossum in our back yard. It's death was confirmed because it was stiff and smelly. I wonder how it got there? Could Trigger and/or Dooley be killers? Say it ain't so; not my children! But, someone had clearly gnawed on its neck. 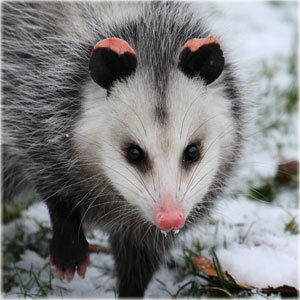 I wish we lived next door to my parents so I could call my dad and have him remove the opossum from our backyard, but since my father was 75 miles away and it was late (and smelly) I had to remove the dead opossum all by my grown self. Rest in peace opossum and in your next life please don't come to our back yard. It's a kill zone. .Actually, opposums are very good at playing dead. Read up on it. I wish that were the case Joseph (the opossum was playing possum) but unfortunately the odor and maggots and blood confirmed the death.